Inventory We are a resale marketplace, not a box office or venue. Ticket prices may exceed face value. This site is not owned by ASU Gammage Theater . ASU Gammage Memorial Auditorium Tempe is located on the Arizona State University Campus and is the last public commission of architect Frank Lloyd Wright. It opened in 1964 and has a seating capacity of 3,017 people. 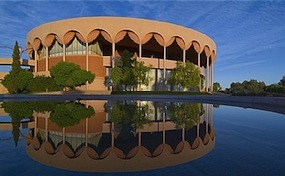 ASU Gammage Box Office is one of the largest university based performing arts centers in the world. It offers three levels of seating including the main floor, grand tier, and balcony. ASU Gammage Auditorium versatile stage can be configured many ways to accommodate a variety of Broadway musicals, solo performances, lectures, debates, etc. TheatreTempe.com is not affiliated with any primary box office or supplier. We are a privately owned and operated business specializing in sales in the secondary market. Prices on our sites will change quickly with demand and can also be above or below face value. To buy tickets for any ASu Gammage Theatre events in Tempe simply click on the event of interest or call our operators at anytime.